We have great success with our “MassModern Collector Study Guides.” Collectors appreciate having the material, and I enjoy pulling the information together. We’ve completed guides to three collections: Frank Lloyd Wright for Heritage-Henredon, 1955; Eliel Saarinen for Johnson Furniture, 1939; John Saladino for Baker, 1984. Each of these approaches 100 pages, and in each case includes an original manufacturer’s catalog. 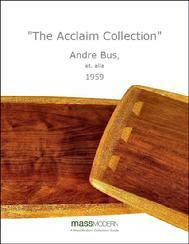 The Acclaim Collection, presumably by Andre Bus for Lane 1958, is a bit different. In working as a historian I insist on “primary source material,” such as original advertisements, newspaper reviews, magazine articles, original catalog material, and so forth. Accuracy matters. I’ve had an extraordinarily difficult time finding this sort of material for Acclaim, which makes it very difficult to develop a fact based study guide. So here is my appeal to other collectors. I have very little in the way of Acclaim advertising material, catalog material, newspaper/magazine articles, etc. What I do have has mostly been gleaned from internet sources and is of poor resolution and reproduction quality. I appeal to any Acclaim collector who has information or original material to scan and share to be in contact. Doing this together we can develop a great Collector’s Study Guide about one of America’s greatest mass market furniture collections.